Do not be alarmed. This is only a drill. So, if you happen to walk into a semi comics-less shop today, don't be too freaked out. You didn't get the day wrong, and it's not one of those pesky Diamond shipping holiday weeks. As reported by Rich Johnston over at Bleeding Cool this past weekend, there was a major accident involving one of Diamond's shipping trucks, and it might affect some shops in the US and UK. Most stores should get their books, but it's probably a good idea to either get in earlier than usual if you can, or to call ahead and have your friendly neighborhood comic book guy put your books aside in advance of your arrival. According to the article, the full print run of two retailer incentive titles--the Deadpool variants of Invincible Iron Man, issue 23, and Wolverine: Savage--were completely destroyed, and will have to go back to press. So, sorry, Deapool fans. Everything will go back to normal by next week, though, and any missing books will be replaced. So don't go all nutty and order everything online, thus leaving your LCS owner with stacks and stacks of overstock next week. There is some good news, however, as it appears that the people involved in the crash seem to be fine. Internet reaction, of course, is focused more on the destruction of paper, but, hey, sometimes you get exactly what you expect. Shipping incidents aside, this week is the second huge new release week in a row, including a rash of event titles and an unusually large number of hardcovers. It's been pretty non-stop since the holidays ended, and I have to believe that the Diamond "skip" week at the end of December has something to do with the wonky schedules. It seems every week brings more books than the last, so here's hoping this trend will level off a bit as February marches on. (Get it? February (M)arches...nevermind.) Of course, this summer being a pretty big comics movie season, that seems fairly unlikely. Get ready for the flood of Iron Man product to assault the market very soon. 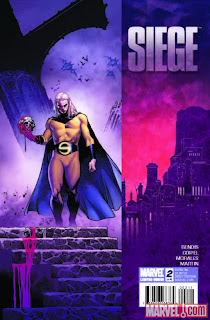 Today there are several books I'm looking forward to, including Marvel's Siege, issue two. 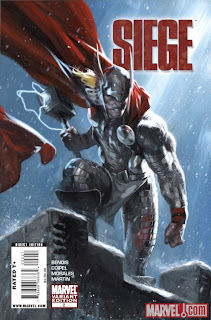 It's written by Brian Bendis and features art by Olivier Coipel, whose pencils I didn't immediately love when he first started with the company several years ago. Since then, though (and especially since his epic Thor run with J. Michael Straczynski), I've become a big fan of his style. I finally managed to catch up to Siege, issue one, this weekend. I had, literally, five months of Avengers titles piled up--both Dark and New--just waiting to be read. And now that Dark Reign is (mercifully) ending, I'm hoping there's a change in direction coming from Marvel. I think the fact that Siege is only a four-issue mini is encouraging, and it makes me think that even Marvel realized that the events after Secret Invasion took way too long to progress. An Avenger will die, eh? Jeez, it's times like this I wish I had checked out the solicit info before sitting down to write this feature. Don't know about you, but I'm getting kinda used to the idea of an Avenger dying, oh, every six months or so. Ms. Marvel just died (and came back), Thor died (and came back), Hawkeye died (and came back), and oh, who am I forgetting? Ah. Right. Captain America died (and came back before he...um...officially came back). Still, death in comics--no matter how fleeting--always, always, always means sales will go up, and since this is a quality, event-y series featuring a big time creative team, it's a safe bet that this book will sell a ton of copies. And, since this is one of the books that might be delayed to some shops, if you don't manage to wrest a copy from the somewhat barren store shelves of your LCS, I'd advise against going online until you find one. As always, expect there to be very little (read: zero) discretion used on the fan sites in reporting the fallout of this issue, so here's hoping our shops manage to get in enough copies for everyone. Seriously, folks. Call ahead if you want one. And, though I hate variant covers, I have to admit. If my shop gets one of these in, I might have to buy it. (One of) this issue's variants is done by the incredible Gabrielle Dell'Otto, whose Thor image is simply stunning, and it's currently the background image on my iPhone. Pretty cool, huh? If you're unfamiliar with his work, be sure to check out Gabrielle's (Flash-heavy) Web site for some spectacular, fully painted art. Anyway, so, yeah. Someone's gonna bite it in this issue. Moving on, let's get to something a little less in the mainstream. From Marvel's imported line, Daffodil, issue two, ships with the Official Exfanding Stamp of Approval. After some debate as to whether or not I'd pick up issue one, I decided to go for it despite the $5.99 price point. As is the case with all of the imported titles offered currently by Marvel, this issue is basically double-sized, and packed with story and art. 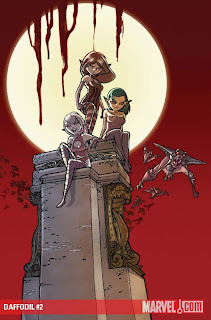 Daffodil and her teammates are following the trail of destruction left by Nosferatu as the great vampire makes his way towards the one entity that will make him the eternal master of the Earth. But first he must defeat Jerk, the chief of police, who holds the creature prisoner! The showdown between the hoard of vampires led by Nosferatu and Jerk’s troops will most certainly be a bloodbath… Can Daffodil get there in time to intervene? This book might be an acquired taste, but I see the potential for huge cross appeal with the Manga readers, as the style is reminiscent of some of the books I've seen in that genre. Horror fans, Manga fans, check this book out. It's a "hidden" gem here in the States, but the creators are well known overseas, and they absolutely deserve a bigger audience here. And finally, I just wanted to give a quick mention of the latest hardcover collection shipping from Dynamite Entertainment this week. I talked this series up with each issue that shipped, and I figured I'd mention it again, just to more thoroughly beat the horse dead. 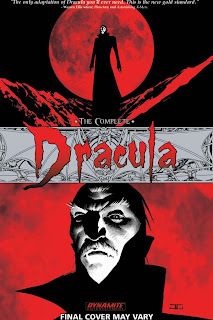 Although it was delayed several months, The Complete Dracula hardcover collection finally hits shelves today, and it's well worth the $25 price tag. Collecting the acclaimed mini series from writers John Reppion and Leah Moore, I can honestly say that this is the very best adaptation of Stoker's work I've ever come across--in comics, television, or film. Dynamite presents the complete story of the Lord of the Undead--Dracula! For the first time in 112 years the original masterpiece from Bram Stoker is fully restored in this sensational graphic collection. If you thought you knew how it all began or how it ends, you were wrong! Open this book and enjoy the real story of Dracula as Bram Stoker had originally imagined it. Writers John Reppion and Leah Moore are joined by painter Colton Worley for an odyssey of life, death, and the blood that flows within us all! This adaptation features fully-painted art, done in a rich, moody style by Worley, all under covers by modern master John Cassaday! Also contains bonus material such as script pages, annotations, a cover gallery, and samplings of the original text by Bram Stoker including the lost chapter "Dracula's Guest! For fans of Stoker's work, I cannot recommend this book highly enough. It's great, and I know a bunch of you guys will dig it. And that's all we've time for today, as I need to do a great many things in the next twenty minutes or so. So, with that...what are you Waiting for?